- Physical Datacenter Security: "Most Overlooked"
- Tenant Lockers - Which Type Works for You? $10 billion a year is stolen at shipping & receiving docks in the U.S. How can you protect your operations? Cargo theft occurs in freight forwarding yards, warehouses and during transportation in trucks, airfreight, and ships. Worldwide, the direct cost of cargo theft exceeds $30 billion annually and $10 billion in the United States alone, with indirect costs many times higher. On top of the cargo costs, losses are amplified by double or more due to investigative and insurance costs. For a business operating on a just-in-time basis, freight loss can be an extreme problem that threatens profitability and viability. According to a study done by the Australian Institute of Criminology, 87 percent of these losses are inflicted at the road transport level, where warehousers, shippers, and receivers of goods are most at risk. Almost any warehouse has something people want, although items such as electronics, footwear, clothing, prescription drugs, computers, jewelry, tobacco, and media such as DVD discs are especially coveted. But nearly anything can be at risk. The most common method employed to steal cargo involves a truck driver working with a warehouse employee. Working together, these parties can easily break a chain of awareness that shippers and receivers put into place and obscure exactly when the theft may have occurred. Cargo is at its greatest risk when it’s being loaded and unloaded. It can be carted off while a driver’s attention is diverted. “Short” orders can be loaded, or loose cargo can be concealed for later removal, according to the AIC report. This timeframe is particularly chaotic, involving people who are mostly concerned with getting the truck unloaded and away from the dock, not with security at any conscious level. Especially since the 2004 Hours of Service working rules change, warehouses and distribution centers are more concerned than ever with the speed at which they load or unload a truck. Unfortunately, this focus on loading speed also makes trucks and warehouses more vulnerable to theft and pilferage. Experts say that besides being thorough in your hiring process—certainly something you should do, but something that’s not bulletproof—there are several common-sense steps you can take. Restrict access to your shipping and receiving areas: This is the point of vulnerability, where confusion and opportunity may meet and allow thieves an opportunity. Be sure everyone in the area has proper identification and is supposed to be there. It’s all about access: you need to control who has it and who doesn’t. If the trucker isn’t involved in unloading, don’t let him loiter in the area; consider providing a lounge area away from inventory and loading docks if possible. Utilize security partitions, cages, secure storage lockers, or mini security cages to lock up things that are particularly desirable to thieves as quickly as possible when they are received. Keep them locked up until you must unlock them before shipping. A number of available accessories can transform standard pallet racking and shelving into secure areas that you can control. Move cargo from receiving into these secure devices as soon as possible. On the shipping side, move it from them into trucks in the same, quick manner. Don't let things sit around the dock doors unattended and unlocked. Make sure all doors and windows have locks. Going further, consider the reason a particular door or window exists at all. When it isn’t being used for business reasons or safety reasons, why keep it at all? You should consult safety experts in advance of permanently sealing a door. Hang around the docks: Nothing is more effective than being there, watching, and participating. Go to the docks, talk to people, make sure they know you know who they are and what they’re doing. This doesn’t have to be an onerous process; a friendly conversation works wonders. Criminals play a percentage game. If the percentages shift, even a little, they may be deterred. This is particularly true in the case of casual thieves who take easy pickings but shun riskier thefts. Make it risky by being around and creating a culture of honesty among the people at the docks. The presence of a watcher can help to do that and make them wary for days. Make sure merchandise isn’t left unattended for long periods of time. It’s folly to allow valuable inventory to stack up, unwatched, in the receiving department. Get it loaded into stock whenever possible. For those periods when you can’t load higher risk shipments into normal storage, look to solutions such as portable, lockable security carts that can stow it away safely wherever it sits. This works even in shipping operations, since you can have a trusted employee unlock it when trucks arrive. If it’s palletized, shrink wrap it so that getting at it requires more effort and more visibility. Use seals that are difficult to reseal once they’ve been broken: Such tools as self-voiding tape and water gum tape make it hard for thieves to hide what they’ve done. If they break a carton seal, it’s visible. In the case of a trucker working with a warehouse employee, this can be particularly effective. Consider electronic security systems and surveillance. You can monitor movements in the warehouse using these tools. Your insurance company may provide better rates to you if you have them, and they are great deterrence. Simple tricks such as installing a dome mirror or an opaque camera dome may deter some people. It lets them know that you’re paying attention. In the end, nothing is foolproof, but a combination of common-sense tactics, equipment, and awareness can significantly cut your chance of losses. Consider the way people steal cars: no thief can be stopped by a car alarm or steering wheel attachment, but they may move on to cars that don’t have these devices. Your efforts aren’t meant to create a totally secure environment—very little can make that happen. 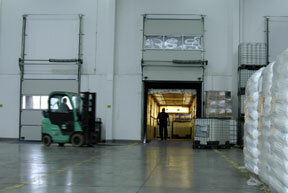 Your shipping and receiving area should become a “hard target’, too risky for thieves to consider.